Pikmin 3, Epic Mickey 2, and dozens more coming to Wii U before the end of March 2013. As we now know, the Wii U will be available on November 18 in North America, with the premium bundle being packaged with Nintendo Land. The publisher also revealed a few dozen other titles that will be available in the Wii U's "launch window," which spans from November 18 to the end of March 2013. 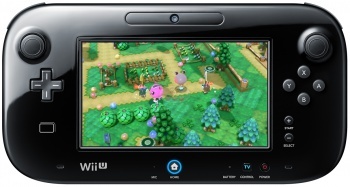 In addition to Nintendo Land and New Super Mario Bros. U, both of which were shown off at the press conference, Nintendo is publishing seven other titles for the Wii U in the launch window: Ninja Gaiden 3: Razor's Edge, Sing Party, Lego City: Undercover, Game & Wario, Pikmin 3, and The Wonderful 101. There are also quite a few games coming from third-party publishers. Ubisoft is leading the pack with eight launch window releases, among them Rayman Legends, ZombiU, and Assassin's Creed III. They're followed by Activision's seven launch window titles, which include Call of Duty: Black Ops II, Transformers Prime, and Skylanders Giants. Other launch window games of note are Monster Hunter 3 Ultimate, Disney Epic Mickey 2: Power of Two, Mass Effect 3, Aliens: Colonial Marines, and Scribblenauts Unlimited. Though Nintendo gave a March 31 cut-off date, I would expect many of these games to be available much sooner than that. We'll have more details as we get closer to the Wii U's launch.